Location: Billiards & Pinball Club BillArt, ul. Jana Pawła II 45, Piaseczno (near Warsaw), Poland. Piaseczno is a city of over 40 thousand people near the Polish capital Warsaw and is actually part of the Warsaw suburbs. When you go by car from the capital is hard to see the division between Warsaw and this city. 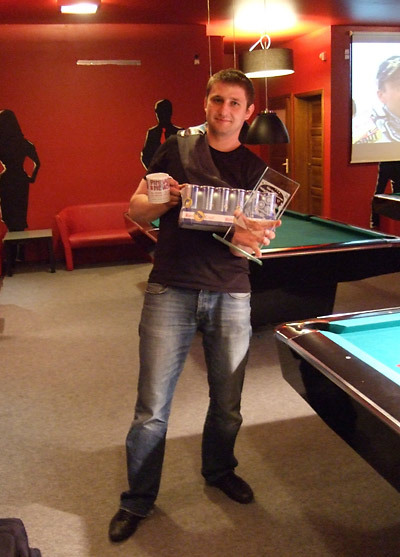 Pawel Nowak came from Warsaw but he now lives in Piaseczno where he has a club - a billiard club. It’s name is BillArt. 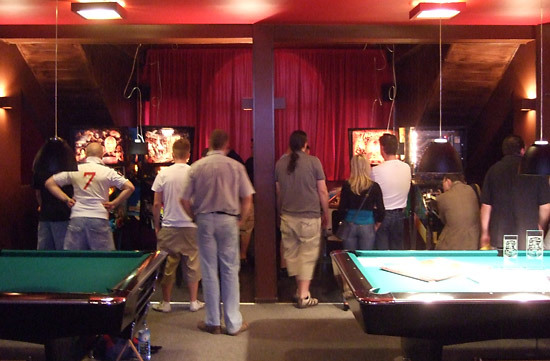 Here you can play pool on its six nine-feet professional tables, darts and - which is really hard to find in Poland, just like it is in the rest of the world - you can play pinball. Not a pinball, but five pinballs! But let's back to Pawel. Nowak and Kowalski are the most common Polish surnames. Pawel (Paul in English) is also typical name, so probably you could find thousands Pawel Nowaks in Poland. Even in Piaseczno there is more than one. But in Polish pinball world, Pawel Nowak is the only one. He is a great fan of both pool and pinball. He started to play pinball when he was about 10 - over 20 years ago. “When I was 15, I played Road Show – this was when I started to become a real pinball fan. This machine was also the first I owned. I bought it 8 years ago and I will never sell it. Later I bought Star Trek - The Next Generation, then two top-rated machines Twilight Zone and Cirqus Voltaire“. The most recent machines he bought were Indiana Jones and Johnny Mnemonic. This nice six machines collection was set up to be used in the biggest pinball tournament held at BillArt - The BillArt Club Pinball Championship (org. Flipperowe Mistrzostwa Klubu BillArt). 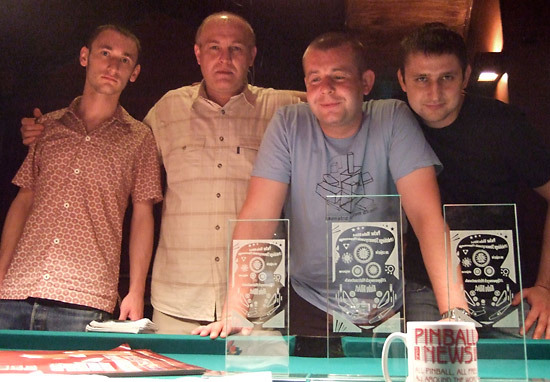 This was the third pinball championship in Pawel’s club. The first was in 2008, then a small tournament with only local players from Piaseczno and Warsaw was held in February this year. 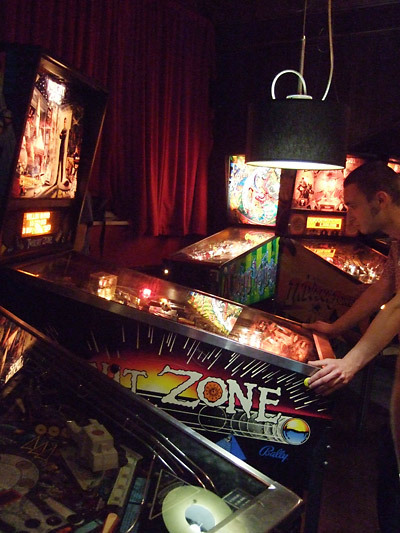 The Polish Pinball Association (org. Polskie Stowarzyszenie Flipperowe) was a co-organizer of this tournament. There is demand for more than just one pinball championship in Poland but we only hold one regularly - Polish Pinball Championship in Warsaw’s club CDQ which is also co-organized by PSF. So Polish pinball fans came from distant parts of our country to Piaseczno but of course the majority of players (around half) came from Warsaw and Piaseczno. 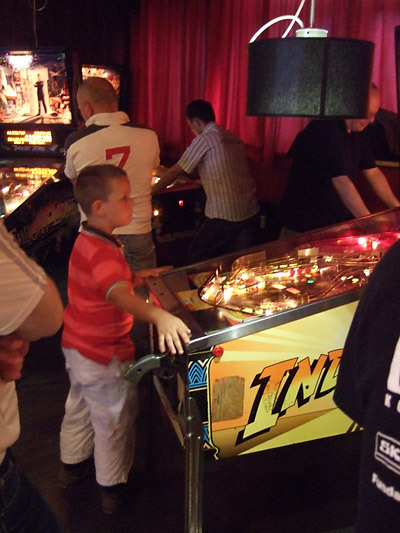 These local pinballers are regular BillArt customers and most of them developed their passion for pinball in Pawel’s Club. Pawel is very happy to have such alumni, some of them starting their pinball adventure in his club with Pawel as their teacher. He was good one. 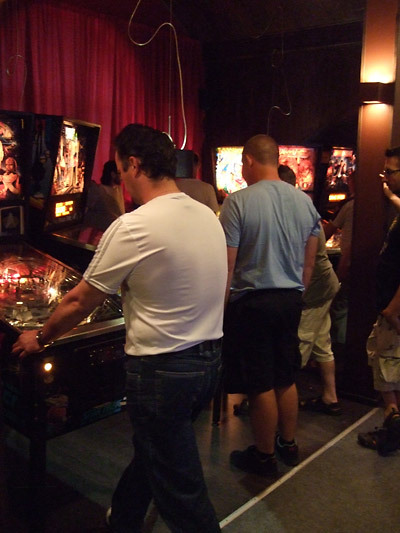 On the 13th of June, 23 players visited BillArt to participate in the BillArt Club Pinball Championship (org. Flipperowe Mistrzostwa Klubu BillArt). Competitors were divided into 6 groups of four players. All the groups played on each of six machines. The results within the group weren't the important thing, because there were individual ranking points awarded for each machine. The best ranked 16 players were all promoted to the next stage. What is important and unusual in this tournament is how all pinballs were set on 4 balls with extra balls enabled. This first qualifying stage started about 1pm and finished just after 5pm. In the quarter-finals, the sixteen player were divided in four groups where first in the rankings was matched with fifth, ninth with thirteenth etc. Starting with this stage, it was the results in the groups which mattered. The quarter-finals games were started just before 6pm. 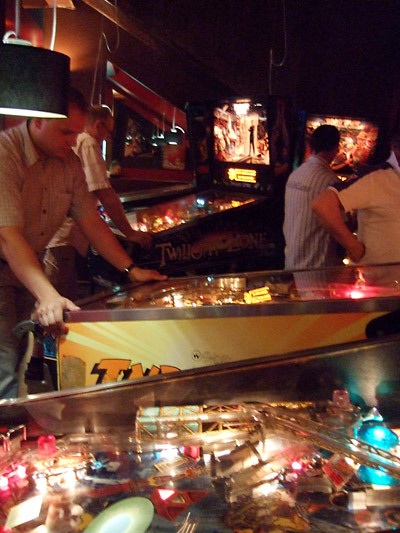 We use four pinballs: Cirqus Voltaire, Indiana Jones, Twilight Zone and Star Trek. There were some technical problems with Road Show and Johnny Mnemonic so these weren’t used in this stage. Later there were some other faults on the other machines which were fixed as quickly as possible by Andrzej Karpinski – the oldest contester at 45-years-old. 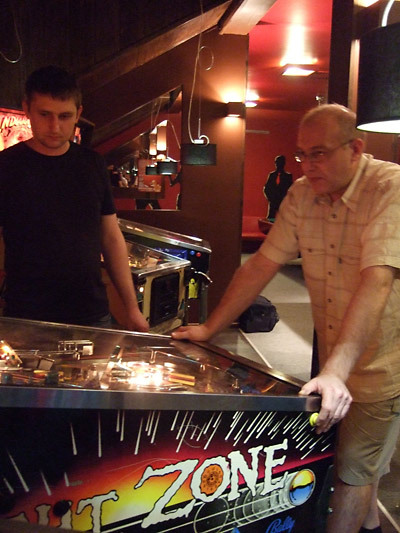 He lives in Radom and is one of the best pinball repair men in Poland. He provided an excellent service for this tournament and was the real dark horse of this tournament. Andrzej was undoubtedly the best in the third group. He got 15 points (the maximum was 16), the next two had 10 points. Daniel Nowak was the best in the second group, while the other groups (first and fourth) went to extra time duels on a randomly drawn machine. Finally, Pawel Nowak and Staszek Nietrzebka completed the eight semi-finalists. That stage started at 8:30pm. We mixed up the semi-final competitors so that the best player in group 1 went to group B, the second in the same group to A, the first in group 2 went to A, second from this group to B, etc. Pawel Nowak and Aleksander Zurkowski with 9 points definitely dominated in group A, while in B it was Andrzej Karpinski (11 points!) and Lukasz Warmijak from Piaseczno (8 points). 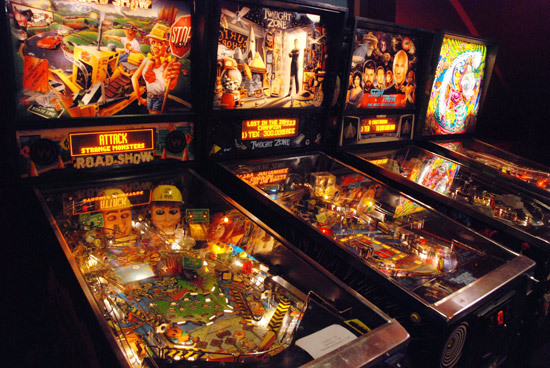 Both groups played on three machines; Twilight Zone, Indiana Jones and Cirqus Voltaire. These four players arrived in the final which was played on: Cirqus Voltaire, Road Show and Twilight Zone. Pawel and Aleksander fought fiercely but in the end Pawel was that little bit better (10 points to Alex’s 9 points), third was Lukasz (6 points) and fourth Andrzej. Andrzej had only 5 points, however he said that he was very happy because it was his debut in a pinball tournament. Those who made it to the final got a very nice, unusual glass trophy designed like a pinball playfield. Pinball News which was a media patron send some pinball gifts. The top three also received a large pack of the energy drink Run Cool. It must be hard to find any other public places in Poland when you could play so many pinballs as BillArt. This club currently offers five machines (after the last tournament Pawel sold his Johnny Mnemonic) but as owner said: “I hope that I will have more. Medieval Madness is my dream but it is very hard to buy it in a good price”. 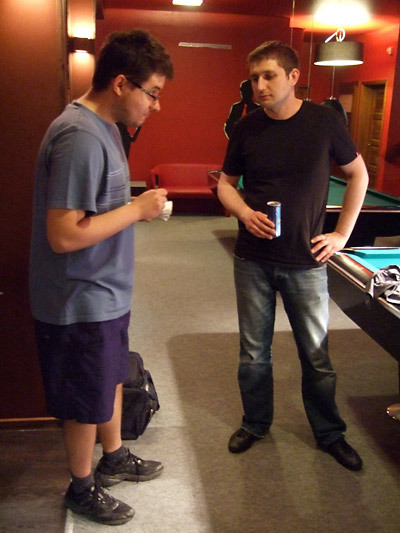 He also has a plan to organise a pinball league next year which will be the first such league in Poland. If you also add Pawel’s aim to organise more tournaments and how he will make all his five pinballs available for Polish Pinball Championship along with other help for this event – THANKS Pawel! 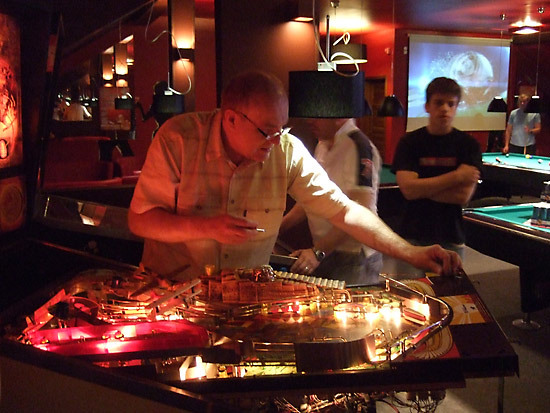 – his club is clearly one of the most important pinball places in Poland.